First of all, I have to say that these were actually supposed to be chicken gyros, but I couldn't find pocketless pitas in my grocery store. 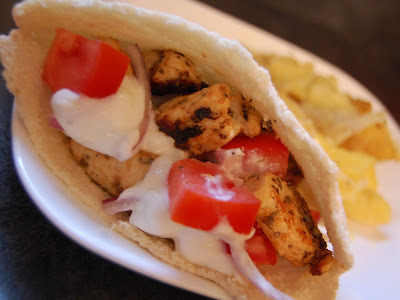 Therefore, they became Greek chicken-stuffed pitas. Ah, well -- it certainly didn't affect the flavor at all, which was pretty amazing. I've seen this recipe floating around on a lot of blogs recently, and I was really excited to try these. There's quite a bit of prep work invovled, so this is perfect for a weekend meal. The chicken is tender and flavorful thanks to the marinade, and the tzatziki sauce is completely addictive. I served these with Greek-style potatoes, and I even dolloped some of the tzatziki sauce on those (it was delicious!). Joe, Andrew and I all really liked these, and I will definitely be making them again! 1. Whisk together the garlic, lemon juice, vinegar, oil, yogurt, and oregano in a bowl. Add the chicken and rub the marinade in. Cover and refrigerate for about an hour. 2. Preheat a large skillet over medium heat. Sprinkle the chicken with salt and pepper on both sides, and then saute until cooked through. 3. Heat the pitas. Top (or, in my case, stuff) each pita with the chicken, tzatziki, tomatoes, onions. 2. Peel and seed the cucumber. Shred the cucumber and squeeze them in a clean towel to get as much moisture out as possible. 3. Mix together the yogurt, shredded cucumbers, garlic, vinegar and lemon juice. Salt and pepper to taste. Refrigerate 30 minutes or more before serving so flavors can meld. Before serving, drizzle a little olive oil over the top. This looks so yumie! I never had Tzatziki sauce until I moved to the netherlands and ate Doner Kebabs and a bunch of other dishes. You can buy it in containers at the store and we love it. I made this the other night and it was a HUGE hit..thanks for posting this great recipe! Followed you here from Sonya's blog. This DOES sound very good indeed. I've never had anything like this and feel a gap in my life!